R. C. Sproul’s Double Imputation Doublespeak. 1. Jesus Christ had no righteousness UNTIL He kept the law perfectly! 2. The real meaning of “double imputation” means our sin is imputed to Christ and His OBEDIENCE is imputed to us. 3. This means the standard for righteousness is perfect law-keeping. 4. This is heresy because the Bible says that righteousness is APART from the law! 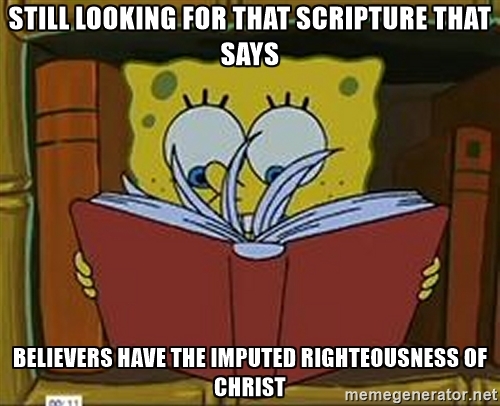 (Romans 3:21, 28). 5. “Redemption” is conflated with “salvation”. So according to authentic protestant orthodoxy, not only do believers have no righteousness of their own, but EVEN JESUS had no righteousness of His own! In other words, Jesus was not righteous because He was the Son of God, He was only righteous because He kept the law perfectly!!! You people who call yourselves “christians” and go to church every Sunday and listen to garbage like this week after week and read all manner of books from authors like this, you might want to rethink some things! Got sin? You do if you are a Protestant, and you have a lot of it. The “T” in TULIP doesn’t stand for total depravity for no good reason, no pun intended. The only good thing is focusing on the bad thing: your nasty, wicked self. In contrast, the emphasis of our Christian lives should be LOVE. We still sin, but it is not sin unto condemnation, but rather sin against our Father as a family matter. We may receive chastisement, but we are in no danger of condemnation. Not so with the Protestant gospel: the “Christian” remains under eternal condemnation and is only covered through faith alone by returning to the same gospel that saved us. This is why Protestantism has always been weak in the area of discipleship. This is why there is an obsession with making saved people rather than disciples. And by the way, the only place we can find continued forgiveness for “sin that removes us from grace” (Calvin/Luther) is under the “authority” of the local church. Go figure. Even in Baptist churches, pastors bemoan the fact that “10% of the congregants do 90% of the work.” Well, duh, I am surprised that even 10% are doing anything as the focus is keeping oneself saved by focusing on how inept we are. A focus on sin will not prevent sin or promote love. If there is something to be gained by finding sin, it will be far from us to fight against it. 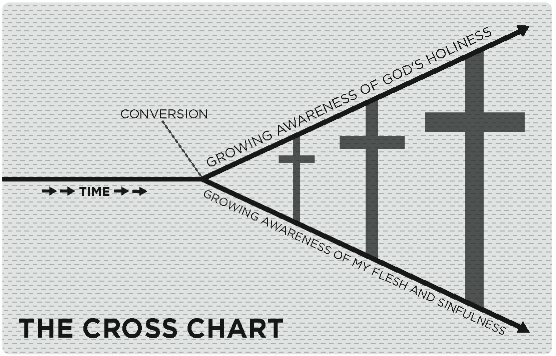 Why would we cut off our supply of blessings by making the cross smaller? It becomes a supply and demand issue. The Bible endorses a focus on love, not sin-searching. 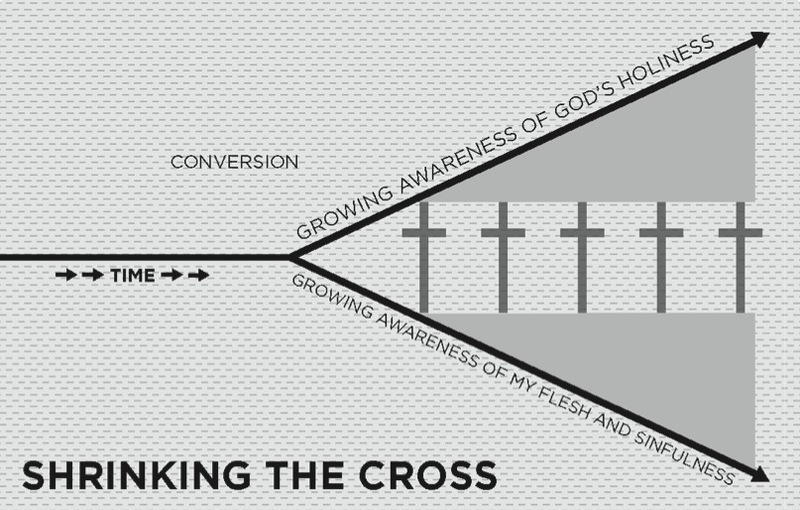 We are to look for ways to love God and others, not ways to find the “sin beneath the sin” or some endeavor to “peel back the layers of sin.” No doubt, there is a CONTROL conspiracy involved with this supposed method of sanctification as well. Stripping people of an accurate evaluation of self is a very efficient way of controlling them. Being worthy enough to hold others accountable for their own good will not get you into heaven—only returning daily to the same gospel that saved you for a fresh set of downs to get into the salvation end zone. We have not been given a spirit of fear under the law of sin and death and its condemnation. We, instead, have been given the Holy Spirit and boldness to love God and others without any fear of condemnation. We are to be enslaved to love—not to a fear of condemnation. Because man is totally depraved, no one can keep the law perfectly. Because no one can keep the law perfectly, we need someone to keep the law on our behalf. Jesus is the only one who ever kept the law perfectly. Because Jesus kept the law perfectly, we must depend on Jesus to keep the law for us. God “declares” us righteous because Jesus’ obedience is imputed to us. The standard for righteousness is perfect law-keeping. The list of problems with this line of reasoning is extensive, not the least of which is the fact that the Bible says righteousness is apart from the law. But when we keep thinking about the ramifications of the above assumptions, the conclusions are obvious. In this construct, a believer is only declared righteous as long as he keeps living by “faith alone”. So if at any time he ceases to live by “faith alone” he puts his justification at risk. This means he is never really “righteous” until he gets to the end of his life. And even then, his righteousness depends on the degree to which he lived by “faith alone”. In other words, no believer can ever really “know” if he is really righteous until all the facts come in. There would have to be sufficient “proof” that reveals that his justification is authentic. But I want to camp on a notion that I doubt very few have ever stopped to consider. If the basis of righteousness is perfect law-keeping, then how is Jesus righteous? Would not He too be required to live a perfect life? Of course the protestant response to this is a resounding, yes. They openly declare that it was by His perfect law-keeping that Jesus was righteous. That is one of the assumptions listed above. But now consider this. How could a claim be made for Jesus’ righteousness until He had demonstrated perfect law-keeping His entire life? It is impossible to claim that Jesus was righteous before he ever demonstrated one good work. Ironically, the same standard that the reformed use for believers MUST also apply to the One who makes justification possible according to their theology. And this just will not work because it makes Jesus’ own righteousness suspect (which the reformed conveniently do not allow for). You cannot reason something after-the-fact! The Reformed gospel makes Jesus’ righteousness a function of works and not intrinsic to His nature. Jesus was not really righteous UNTIL He had demonstrated perfect law-keeping. Furthermore, such a conclusion of His righteousness could not have been realized UNTIL the end of His life. Jesus is righteous by virtue of the fact that He is God’s Son. He has His own righteous nature because He was born of God, God’s offspring. He was not righteous because of His perfect law-keeping. It was intrinsic to who He is. I can go to the NFL’s web store and order a jersey of my favorite football player, maybe Peyton Manning. When I receive that jersey in the mail I can now say I have Peyton Manning’s jersey, or I have the jersey of Peyton Manning. Does that mean that I have Peyton Manning’s ACTUAL jersey that he ACTUALLY wore when he played in games? Of course not. But it is still a jersey. It is similar (identical, like in kind) to Peyton Manning’s in every way with one exception; this one belongs to me. Our righteousness is this way. Does this mean that we have the ACTUAL righteousness that Christ had? Only in the sense that it is IDENTICAL to it, the exception being is that the righteousness we have actually belongs to us! Why is that? Because it was given to us the moment we were born again. It is not a covering. It is intrinsic to the nature of our being as a child of God. Whether reformed/protestants want to admit it or not, the fact remains that their construct of righteousness is works-based justification. It might not be “us” doing the works, but works are works no matter who does them. Not only is it works-based, it is progressive, meaning it must be performed throughout one’s life. This is why there is NO DIFFERENCE whatsoever between Catholicism and Protestantism. They both believe in a works-based progressive justification. Protestants have simply taken the “work” away from us and given it to Christ. And in the process, they have made Christ’s own righteousness predicated on works. If you still have any doubts about the logical conclusions to which one must come when law is the standard for righteousness, consider what R.C. Sproul is on record stating. Just about the entire authentic protestant/reformed camp threw Tullian Tchividjian under the bus because his preaching wasn’t “nuanced” enough for thier taste. 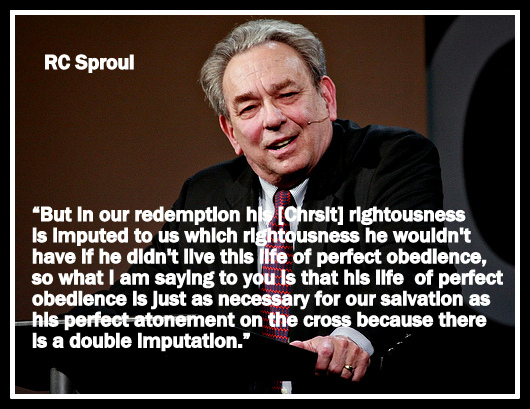 Frankly I am incredulous that they haven’t done the same with Sproul considering this quote. Talk about lacking nuance!